Delayed or unpredictable cash flow negatively impacts business success. Improving cash flow through faster payments could be the solution that differentiates one business from its competitors and makes it the best at what they do. Whether that’s by offering a better price, the best quality product or service, the easiest access to solutions, or truly outstanding customer service. The most successful companies find ways to differentiate themselves from the crowd to meet their customers’ needs in a superior fashion. A slow payment cycle can significantly and negatively affect day-to-day business operations by impacting the flow of funds received or paid out by a business for its activities (cash-flow). Purchasing inventories of finished products or the raw materials needed to produce products, paying staff on time for their labor, generating revenues by selling goods and services to consumers or other businesses — all affect a business’s cash flow, working capital and liquidity. In addition to maintaining sufficient operating funds, other differentiators for competitive advantage in an industry include the abilities to invest in new equipment, facilities, research, and product development. Improved cash flows also allow companies to take advantage of trade discounts on purchases to lower their operating costs, and to retain the cash needed to weather a sluggish economy or to work through slow periods. Maintaining consistent, positive cash flow affects a company’s credit rating and ability to obtain financing from banks and investors too. Who wouldn’t want to receive payments faster? Business owners worldwide suffer when slow payment cycles negatively impact their business accounts. Faster payment receipt helps them maintain consistent operations, reduce risk, retain valued employees, and grow their businesses. The 2016 Flavors of Fast report from financial services firm FIS reports on 28 real-time payments initiatives currently underway globally, and highlights increased usage volumes as far away as India and China. A recent study of SMBs in the United Kingdom confirms they’re frustrated too with slow payments in their part of the world. According to the survey results, nearly all (95 percent) of the small business owners who participated believe that real-time and other faster payment options on the horizon will have significant, positive effects on their businesses. Online shopping is ubiquitous, and is booming around the world. Gone are the days when the only way a customer could get what she wanted was to drive to a store, search the racks and shelves, pay with cash or a check, and carry a prized purchase home. Now she can shop whenever and wherever it’s convenient, because online stores never close. And she can do it with one click. The right faster payments tools will ensure a piece of that growing pie is paid to your online business. Expand your customer base by enabling customers from around the world to purchase your products online quickly and easily using payment cards — both credit and debit. Credit cards are an essential payments channel for online merchants. Accepting all major credit and debit cards ensures your ability to accept cross-border and global payments. Couple that with a robust secure payments gateway and the right product distribution model, and you’ve got a successful start as an online business. When choosing a web-based payments gateway, be sure it’s labeled PCI compliant. The “PCI-Compliant” designation ensures the gateway conforms to industry standards and best practices for transaction security and personal information protection. The best secure payments gateway for your business can also help streamline payments processing and lower costs by eliminating the need for manual card processing and special software. With the advent of new technologies and investments by many players — payments industry old timers and newcomers alike — payments channels have expanded from only checks, wire transfers, bank issued credit and debit cards, or in-person cash transactions. Payment channels now include all of those plus online, mobile apps, email, smartphones and text messaging. With real-time payments offerings developing at breakneck speed in the payments industry, there’s a genuine opportunity for banks and other payment processing partners to demonstrate tangible value for businesses. 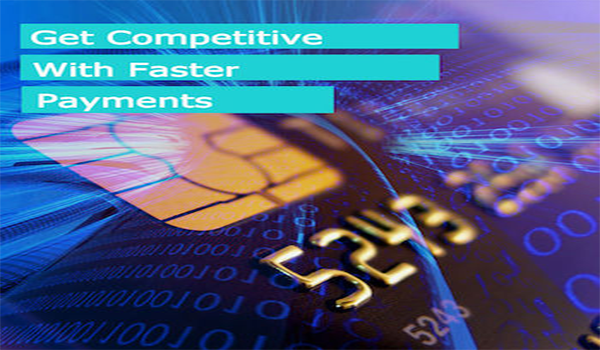 But which bank and which payments solutions best meet your business needs? Working with the right payments processing partner can help you sort through the myriad solutions available to find the ideal answer for your business. The right merchant services provider will understand thoroughly the complex payments business, and your industry. Together you’ll develop a plan for faster payments and choose the tools and solutions to meet your needs.